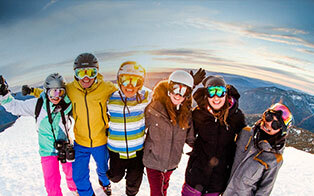 Find out about all the events that are happening at Mt Buller! Enjoy your Easter eggs at altitude! There is plenty of fun for the whole family at Mt Buller's 2019 Easter weekend. Join us as we celebrate the end of the summer mountain biking season with one last hurrah! Mt Buller's official Opening Weekend is always full of fun and celebration. This amazing festival arrives at Mt Buller for one screening only. Fun filled activities for children during Kids' Week. Ski and golf your way to local glory with your teammates to raise money for Mansfield schools. We roll out the red carpet to our friends from South Australia for a week of great times. Australia's most spectacular rail event hits the Village Square at Mt Buller again this winter. Race events include Giant Slalom, Super Giant Slalom, Skiercross, Boardercross and Slopestyle. Students from schools across the state skate and glide their way along the race course. Test your park skills against your mates in a fun but professional environment. Your chance to get animal on skis. Open to all skiers. Which school will take home Victoria's most coveted boarding and skiing trophies? See the world's best on the Chamois bumps! Tighter, Brighter, Shinier...Mt Buller's 80s Day is back! Fun filled activities for children at the Kids' Week. Celebrate the final weekend of what has been an incredible snow season.